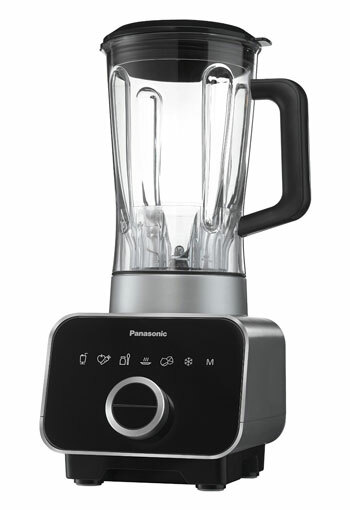 Panasonic just added a new high-power blender to its kitchen appliances line-up, the MX-ZX1800. 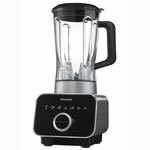 With a 1,200-Watt motor and a $599 list price, the ZX1800 is Panasonic's new flag ship device, positioned to go head-to-head with Vitamix, Blendtec and other premium blenders. We received the ZX1800 blender as a gift at a recent Panasonic appliances event to showcase healthy cooking and asked to showcase our own healthy cooking recipe. We were more than happy to put the Panasonic through its paces. And it didn't disappoint. First off, the MX-ZX1800 is a beautifully designed blender that will look great on any countertop. Clad in aluminum, with a minimalist black face, it is arguably the most attractive premium blender available. Panasonic also got the size right; its 61oz pitcher and base are short enough (just) to fit underneath your upper cabinet when not in use. Controls are simple, with six presets for smoothies, soup, crushing ice and other common blender tasks. For those wanting more control, there is a variable speed manual control, as well. There is a tamper included, to help with trickier ingredients, and an insulated ice jacket that will keep frozen drinks in the pitcher cold. Everything we made in the ZX1800 came out great: it whipped up frozen smoothies in no time; hummus was silky smooth; and simple soups could be made directly in the blender, with the blade friction heating the soup to serving temperature. And, the controlled motor start on the ZX1800 meant liquid wasn't catapulted out the top of the pitcher every time it was turned on. While there is no shortage of healthy recipes we could create using the ZX1800, we decided on a family dinner soup that was a riff on the traditional Italian zuppa di ceci and the flavors of Spain. Since this is intended as a weeknight family meal, we kept the prep simple, and went with tapas style shrimp and chorizo as our proteins (to satisfy the mixed tastes of my three kids). The result is a hearty dish with deep flavors that can be as healthy (shrimp) or not (chorizo) as you like. Combine all ingredients in a stock pot and bring to a boil. Simmer for 30-45 minutes until chickpeas are tender. In batches, add soup ingredients to blender and puree until smooth. Be careful not to over-process or starches in chickpeas may breakdown and soup will become gluey. During final batch, if you desire a chunkier consistency, do not blend until smooth, leaving chickpeas somewhat chunky. Combine batches back together and taste for salt and pepper. Serve with Spanish-style shrimp or chorizo over top. Add paprika and cook for 30 seconds. Add shrimp in a single layer and cook for about one minute. Flip and cook for a minute more. Add garlic to the pan and stir together with shrimp just until garlic is beginning to color, about a minute more. 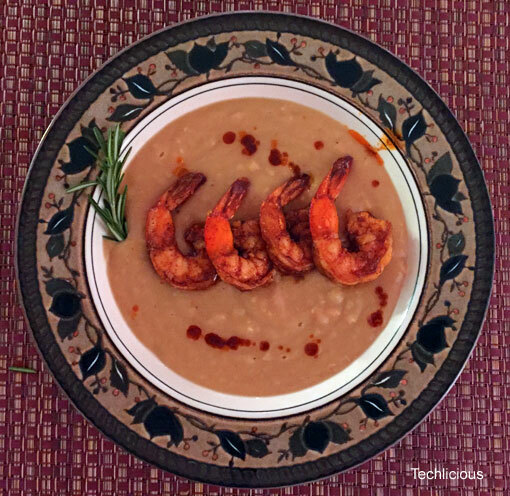 Remove from heat and serve shrimp on top of chickpea soup, drizzling paprika/chickpea oil on soup for extra flavor. Add chorizo and cook, stirring occasionally, until chorizo is lightly browned. Remove from heat and serve on top of chickpea soup, drizzling chorizo oil on soup for extra flavor.